Re-engineered, thinner, finer and sleeker then the original Gillette Fusion blades, Proglide uses an advanced low-resistance coating for less tug and pull. A quality you can feel, Proglide moves across the skin smoothly and efficiently, for a shave that's as close as it is comfortable. Featuring Gillette's unique Flexball technology, the Proglide razor bends to match the face's contours for an even greater shave. 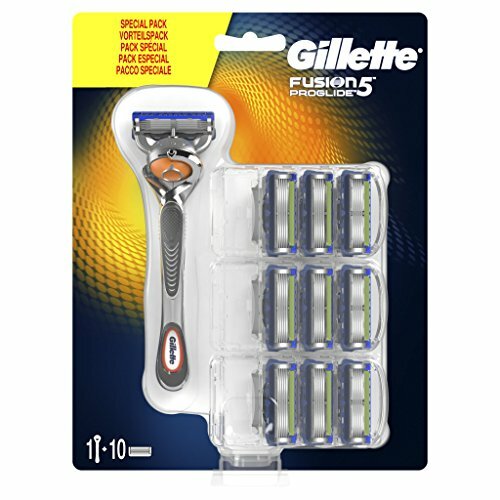 This pack includes one Gillette Fusion Manual Razor with Flexball and 9 replacement Proglide cartridges.